The Invacare Spectra Blitz powered pediatric wheelchair could well be the perfect powerchair for your child. 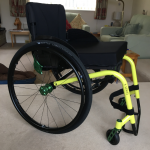 Suitable for use both indoor and outdoors the Spectra Blitz powerchair has a unique adjustable seating system that can adapt as your child grows. The Spectra Blitz the pediatric version of the Spectra, the best-selling powerchair from Invacare. What really sets this powerchair apart is its highly configurable seating system that allows it to grow with your child. Being able to make precision adjustments means your child is the most comfortable and supported as they can be. Featuring a height and width adjustable backrest as well as having a settable angle for easy positioning allows you to properly manage posture. 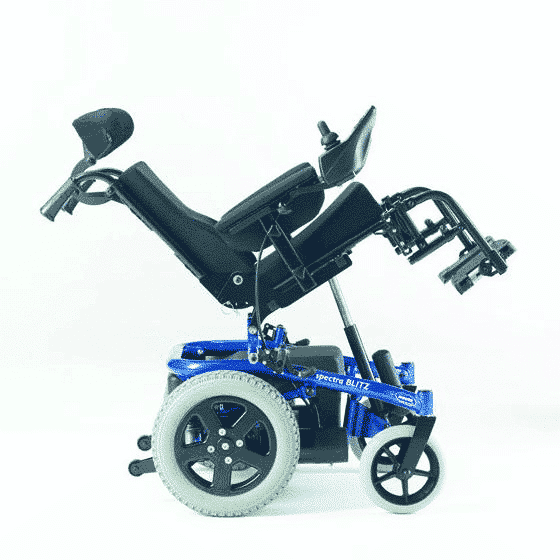 Height adjustable swing away leg rests means transferring on and off the powerchair is easy and stress free. As your child grows they’re needs are going to change, having this level of fine tuning adjustability is important in ensuring they live a comfortable life. Being able to revisit and alter the adjustments later really means the Spectra Blitz can ensure a perfect fit all the time. 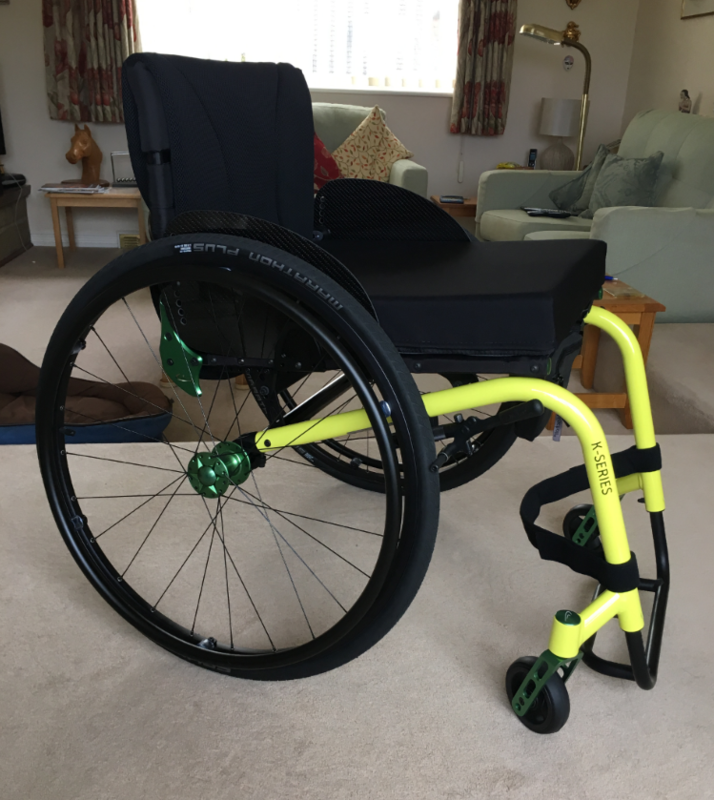 One of the more favored wheelchairs used by the NHS, the Spectra offers ideal levels of simplicity, affordability and adaptability. Just like its full-sized counterpart the Spectra Blitz offers the same. Compact dimensions make the Spectra Blitz one of the smallest pediatric power chairs in today’s market. This high level of maneuverability is ideal for use around the home, the narrow width of the Spectra Blitz makes it easier for a smaller user to drive. 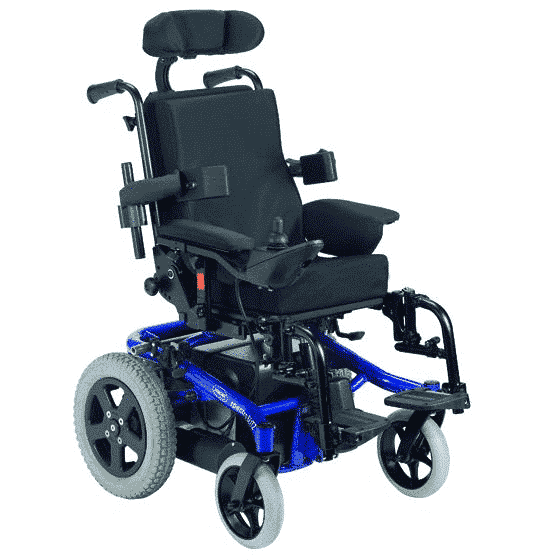 Able to be driven indoors and outdoors as well as featuring sprung rear wheel suspension the Blitz can tackle a variety of terrains whilst still providing a comfortable smooth ride. Being fully crash-tested allows the Spectra Blitz to be used as occupied transport in any vehicle that has been suitably adapted. Shark II electronics have been incorporated into the Spectra Blitz giving easy controls to allow the user to have complete independence. The motor included has a top speed of 4mph and an impressive range of 14 miles on one single charge. This means your child will have the freedom to travel inside or outside without the worry of the battery running out. 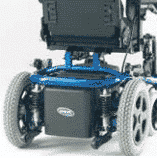 Overall the Spectra Blitz from Invacare is an incredibly adaptable and versatile powerchair. The compact design and being able to be used anywhere will give your child the freedom and independence to do what they want. Offering excellent maneuverability and performance, the Spectra Blitz can be adapted to suit your child’s unique needs and change with them as they grow. If you would like to know more about our range of mobility power chairs or any of our mobility products please contact us or call into one of our showrooms and talk to one of our expert and friendly sales advisers.